Pichai is the chief executive officer (CEO) of Google Inc. 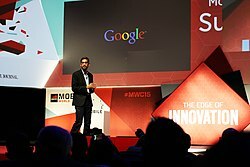 Formerly the Product Chief of Google, Pichai’s current role was announced on 10 August 2015, as part of the restructuring process that made Alphabet Inc. into Google’s parent company, and he assumed the position on 2 October 2015. Pichai was born in Madurai, Tamil Nadu, India, the son of middle-classTamil parents Lakshmi and Ragunatha Pichai. Sundar grew up in a two-room apartment in Ashok Nagar, Chennai. Sundar completed schooling in Jawahar Vidyalaya, a Central Board of Secondary Education school in Ashok Nagar, Chennai and completed the Class XII from Vana Vani school in the Indian Institute of Technology Madras. Pichai earned his degree from Indian Institute of Technology Kharagpur in Metallurgical Engineering. He holds an M.S. from Stanford University in Material Sciences and Engineering, and an MBA from the Wharton School of the University of Pennsylvania, where he was named a Siebel Scholar and a Palmer Scholar, respectively. Pichai worked in engineering and product management at Applied Materials and in management consulting at McKinsey & Company. 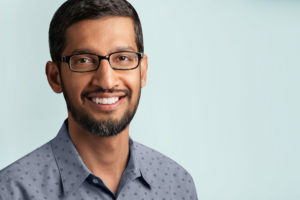 Pichai joined Google in 2004, where he led the product management and innovation efforts for a suite of Google’s client software products, including Google Chrome and Chrome OS, as well as being largely responsible for Google Drive. He went on to oversee the development of different applications such as Gmail and Google Maps. On 19 November 2009, Pichai gave a demonstration of Chrome OS; the Chromebook was released for trial and testing in 2011, and released to the public in 2012. On 20 May 2010, he announced the open-sourcing of the new video codec VP8 by Google and introduced the new video format, WebM. On 13 March 2013, Pichai added Android to the list of Google products that he oversees. Android was formerly managed by Andy Rubin. He was a director of Jive Software from April 2011 to 30 July 2013. Pichai was selected to become the next CEO of Google on 10 August 2015 after previously being appointed Product Chief by CEO, Larry Page. On 24 October 2015 he stepped into the new position at the completion of the formation of Alphabet Inc., the new holding company for the Google company family. In August 2017, Pichai drew publicity for firing a Google employee who wrote a ten-page manifesto criticizing the company’s diversity policies and arguing that “distribution of preferences and abilities of men and women differ in part due to biological causes and … these differences may explain why we don’t see equal representation of women in tech and leadership”. While noting that the manifesto raised a number of issues that are open to debate, Pichai said in a memo to Google employees that “to suggest a group of our colleagues have traits that make them less biologically suited to that work is offensive and not OK”. Pichai is married to Anjali Pichai and has two children. He lives in Los Altos Hills Pichai’s interests include soccer and cricket. He is an avid fan of FC Barcelona and states that “he watches every game of the club”.